Hellelujah is a rip-roaring blend of darkly hued alt-metal and Southern-fried grooves slathered in swagger. The riffs come fast, hard and mean. Guitarist C.J. Pierce slashes and tears viciously on breakneck ragers “Drop” and “Stomping Ground.” The Dallas outfit also demonstrate their penchant for versatility. “Another Name,” an Alice in Chains-inspired ballad heavy on somber, acoustic textures, feels light years removed from “Goddamn Vultures,” a nü metal-style mosh anthem that’s deliriously heavy. But at no point does Hellelujah feel too varied for its own good. 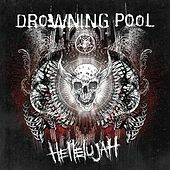 Wizened veterans who have been unleashing deafening mayhem since the early ’00s, Drowning Pool know what they do best and stick to it with uncompromising determination.